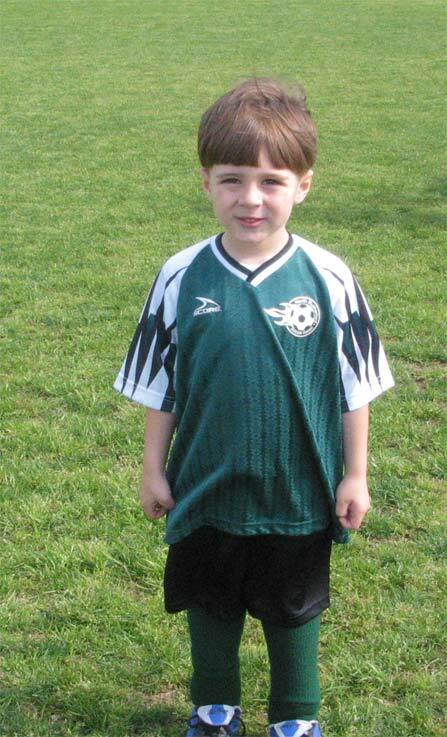 I know everyone has been wanting some pictures of Conner in his soccer uniform, so I finally got around to pulling a few out, cropping them, sizing them, and loading them up for you to see. The last two games have gone well. Unofficially they have won every game they've played. I say unofficially, because we don't keep any kind of official score for the games. 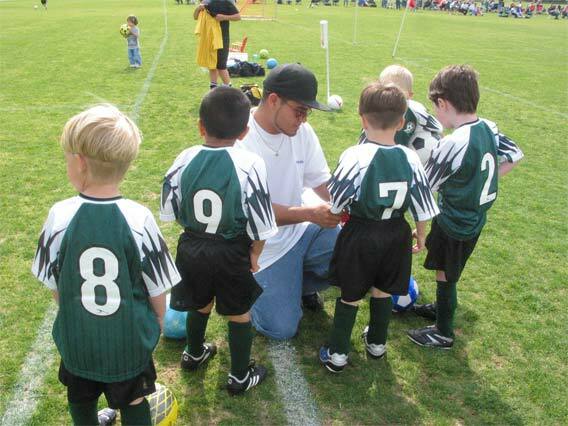 Most of the kids have a sense of either they are winning or losing and of course all the parents know who is winning. Two games ago, Conner's team played against a team that one of his good friends plays for. They fortunately played well together and didn't get in any fights or anything. He and Max have been known to get a little wild together even though they are very good friends. In last week's game, I think we "unofficially" won 5-2. However, one of the boys from the other team scored on our goal, so that truly wasn't a score for us if you want to be technical. 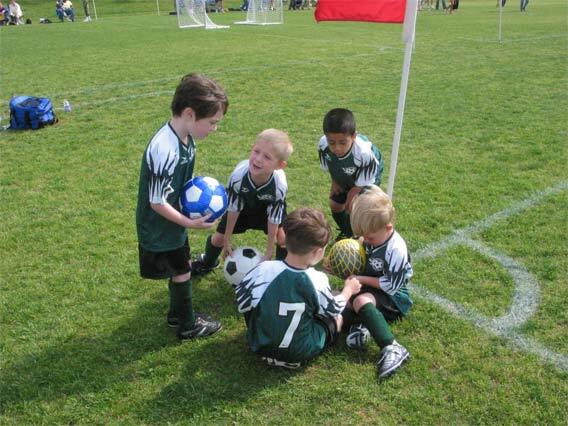 There was one little boy on the other team that every time he'd get the ball, he would TAKE OFF with it. He was FAST! The only problem was, he always ran in a dead straight line. So, whatever angle he was at when he got the ball, that's where he was going with it. The second problem was, getting him to stop. 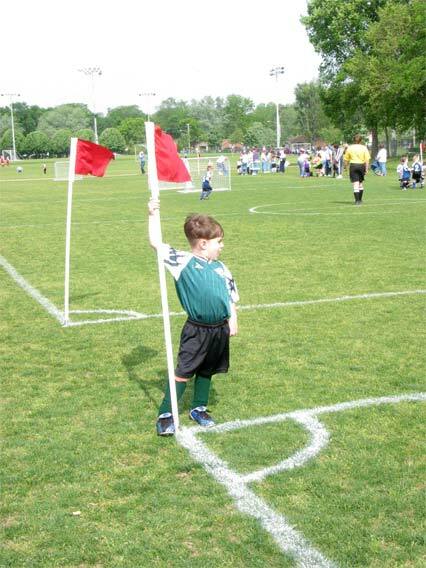 We had to chase him down once after he was halfway to the opposing goal.... ON THE NEXT FIELD OVER! hehe.... ahhhh... great stuff. 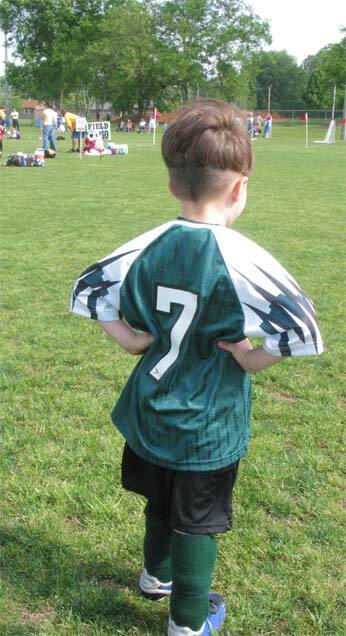 The biggest thing to happen in last week's game though was that Conner SCORED HIS FIRST GOAL EVER! WooHoo! He was very excited. For the last two weeks, on the way to every game and almost every practice he has said at least one of the following, "I really want to score a goal. I'm not sure I'll ever score a goal. I'll work much harder to score a goal. I'm going to do my best to score a goal." We were very happy for him and very proud. He was proud of himself too, which was really cool to see. Anyway, here are some more great pics of game day. 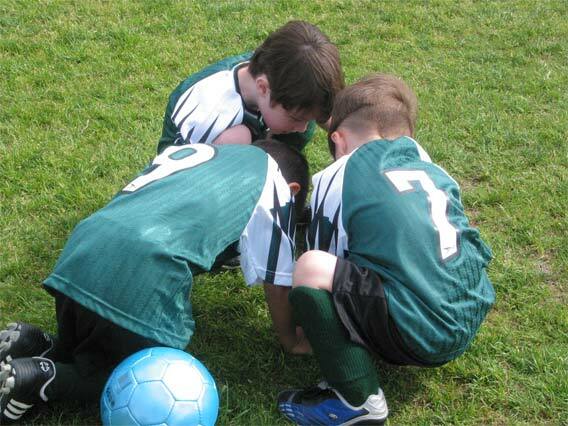 You can see the guys before the game, all intently studying a spot of dirt in the ground. I still don't know what it was they were doing. I think they found a bug of some sort I'm pretty sure. Go figure, they're boys. 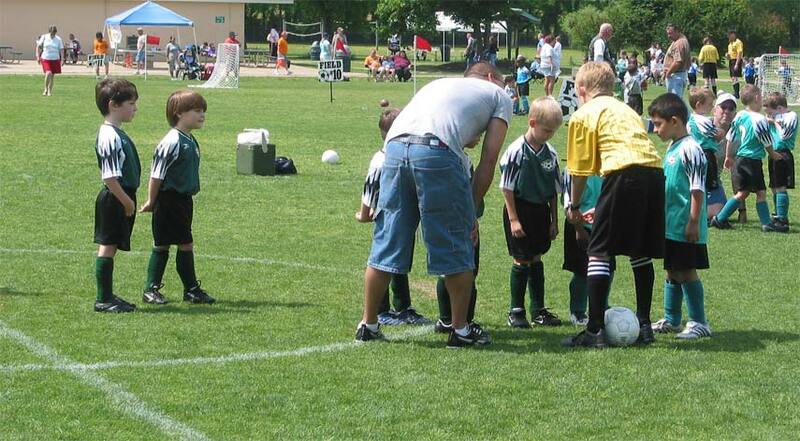 You can also see some of them standing around talking to our coach (he's the head coach, I'm the assistant). 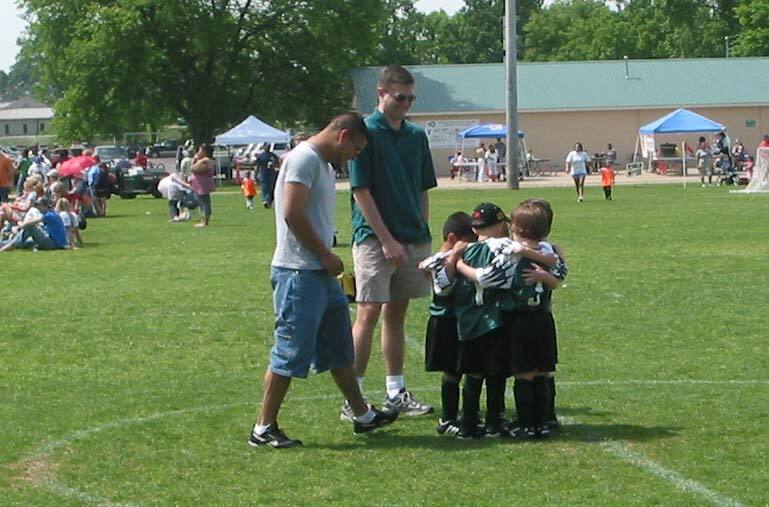 One of the pics, you can see the boys standing with their arms around each other in the middle of the field and Jose and I are standing there laughing at them. They did this all on their own. We don't have any idea what they were doing. They huddled up and were jabbering at each other. It was quite cute and hilarious. In one of the pictures you see Conner holding the flag like he just claimed the land as his own. I don't know what he was doing, but it was too funny not to capture on film (pixels).